The SMOK TFV12 Prince Cobra Edition tank is an upgraded version of the SMOK TFV12 Prince. SMOK just keeps on raising that bar. And believe me, they won’t stop doing it. Constructed out of durable stainless steel, the SMOK TFV12 Prince Cobra Edition Tank can withstand heavy everyday use. 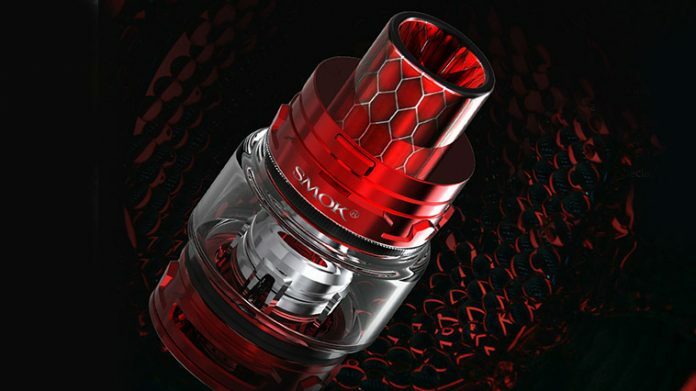 SMOK makes products that will last and this tank is no exception. The Cobra edition tank has a 7ml e-juice capacity, which is such a luxury. Less time spent refilling your tank is always a plus! The glass tube of the TFV12 Prince Cobra is made of borosilicate, which is great for flavor purity (i.e. no chemical break-down or plastic residue over time). Known for reliability and innovation, SMOK’s releases not only improve in technology, but they are also becoming more and more stunning. The TFV12 Prince Cobra tank has a metallic mesh piece that sits inside of the glass. The design is incredible. It’s reminiscent of snake scales, and in my mind, the way that coil technology is evolving. It has SMOK’s top fill system, so it’s easy to fill the tank without unscrewing the atomizer from the mod, and a nice bottom airflow system. As usual, you’ve got a few different color options: stainless steel, black, green, purple, rainbow, gold, and two transitional colored designs, red to white and blue to white. I mentioned the mesh piece reminding me of the mesh coils that are coming out. And here’s what I meant by that. The new kanthal mesh coil technology, adopted by SMOK and a few other brands, allows for the ultimate balance of flavor and clouds, without having to sacrifice one or the other depending on your wattage preference. Some other coils have a breaking point where the flavor quality drops off, even though the cloud production sits best at that wattage. These new coils are supposed to prevent some of that from happening. A SMOK TFV12 Prince Cobra Edition Tank, a SMOK Prince Strip Coil (0.15 Ohms), a SMOK Prince Mesh Coil (0.15 Ohms), a SMOK Prince X2 Clapton Coil (0.4 Ohms), an acrylic bulb Tube, an acrylic drip tip, a bag of spare parts, and a user manual. The SMOK TFV12 Prince Cobra Edition tank is a great buy, whether you’re interested in upgrading your current mod a little with a nice, new tank or you’re already an avid SMOK fan. The best features of this tank are the high e-liquid capacity, the compatible coils options, including the Prince Mesh Coil, and the high-quality Borosilicate Glass tube. More importantly, for flavor and clouds, this tank will not let you down. Interested in other SMOK products? Check out our hardware review section. Like what you just read? Consider clicking one of the affiliate links or using the Deals page on the site. You get the chance to buy products (often at a discount) from great companies, and we get a small commission when you use these links — which helps keep the lights on and pay for more great content. It’s a win-win! Previous articleCould Nicotine Prevent Alzheimers and Treat MS?